"The interface has ruptured," sings Sean McBride on Par Avion's opening track. Trouble is, the music that supports McBride and co-lead singer Liz Wendelbo tells us quite the opposite: a vintage analog Serge synthesiser sprinkles pleasantly alien bleeps over a soft drum machine thump, like synthetic raindrops falling on a Tron landscape. If anything, it's a testament to a beautifully functioning motherboard. 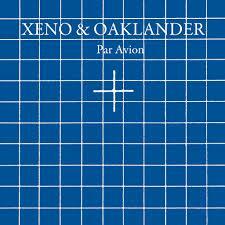 Herein lies the intriguing and frustrating qualities of Xeno & Oaklander's fourth album (and first with Ghostly International). The Brooklyn duo's classic coldwave aesthetic is often entrancing, with McBride approaching pop through percussive synth melodies, then stepping away with hibernating tempos and layers of digital permafrost. It's part Some Great Reward-era Depeche Mode and part conspicuous art film soundtrack, that satisfying clash of electronics and human pretentiousness that makes for impeccable sulking music. Yet the duo aren't satisfied to just let the clash happen via instrumentation. On that opening track, 'Interface', McBride and Wendelbo sing simultaneously about how relationships are like computers, their passive voices winding together to effectively blur comprehension without a lyric sheet handy. "Contained in one space/Light in a chamber/Sounds in walls," shares Wendelbo, her voice seeming ethereal compared to her partner's sleepy, talky tenor. It's almost too much, an unnecessary metaphor slathered on thick – but thankfully the production treats the vocals as just another instrument, something you can easily shift your focus from. The duo attain the perfect balance on 'Nuage d'lvoire,' where Wendelbo handles all the vocal duties, sings in a lovely French that distances us from any weighty ideas, and floats assuredly through McBride's deceptively basic production. He generates those raindrops again, except this time they're cranked to frenetic triple-time within another Depeche Mode-y earworm of a groove. The striking internal clashes of the electronics, coupled with the easy flight of the vocals and words that support that buoyancy (the title translates as 'Ivory Cloud'), plays to all of Xeno & Oaklander's strengths. It's a height they don't often reach on Par Avion, which on the whole seems a bit too impressed with itself. McBride and Wendelbo spend a third of the album singing two different lyric sheets simultaneously, and while it's an ambitious idea when you look at the words side by side, it has a muddying effect on a style that thrives on simplicity. (And if you're interested enough to pull the lyrics apart, you'll find lines like "A voiceless whisper marks the pain," and unless you're 15, that's probably not a good discovery.) 'Jasmine Nights' has an appealingly mysterious tone that hearkens back to 1990s Everything But The Girl, but "jasmine nights" becomes comically "poetic" the more times you hear it, especially when Wendelbo's stubbornly soft, gentle voice refuses to sell it to us. If Par Avion wasn't so clearly aiming for the cheap seats with its ideas, it would be easier to forgive its flaws and just appreciate how great these synthesisers sound, how stunningly they're utilised. But then you hear the closing 'G. Bruno', where McBride once again gets in his own way, lazily stating the obvious: "The bursts of code are straight and form/Our instance." If this record is an omen for the inevitable battle between machines and the human spirit, then my money's on the former.